Session Description: iMovie is a powerful video editing tool that can be enhanced by embedding resources created in Lego MovieMaker, SnapSeed, Photobooth and Explain Everything. Take iMovie to the next level by importing media from multiple sources. Session Description – Are you ready to start creating and sharing learning journeys with the power of Google Geography? Google Maps, My Maps, Google TourBuilder, Google Earth, and Google Streetview App can empower visual learning. 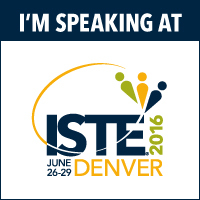 One Response to "ISTE 2016"
I enjoyed your workshop very much. You made it interactive and hands on. When it came to questions, you patiently answered everyone’s inquiries. Thank you.